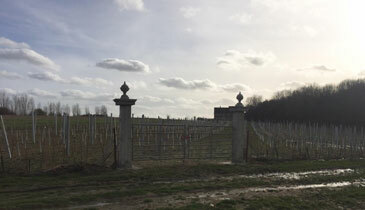 The vineyard is 2 acres at present planted between 2018 and 2019 situated in the heart of Cambridgeshire. The vines planted are predominantly the sparkling wine varieties Pinot Noir, Chardonnay, Pinot Meunier and Seyval Blanc, situated on a sheltered slope overlooking the Cambridgeshire fenland. The vineyard is named after the mediaeval manor that owned the land, La Leghe meaning the light in Norman French. We hope to crop in three years time, initially selling grapes and producing small amounts of sparkling wine, with possible expansion of acreage and wine production in the future. Unfortunately the vineyard is not open to the public at present.